Rick provides clients with skilled and responsive representation in the areas of fire loss, insurance, construction, product liability and commercial litigation. Over the years, he has represented clients in courts of almost every Indiana county, the Indiana appellate courts, and the Seventh Circuit federal courts. 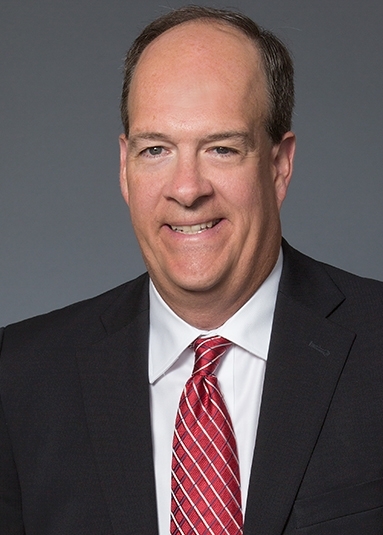 Since 1990, Rick has represented companies, insurers and insureds in fire litigation matters. He has litigated fire cases involving defective products, gas and propane explosions, fire suppression systems and suspected arson. His clients frequently engage him to assist in securing the fire scene and evidence, selecting experts to determine the cause and origin of the fire, and working with government officials and experts during their investigations. He is familiar with the intricacies of fire litigation including NFPA guidelines and code regulations. Rick also represents clients on insurance litigation matters. Clients frequently ask Rick to analyze and litigate complex insurance coverage questions relating to commercial general liability, automobile, property and homeowner policies. He represents clients in insurance coverage disputes including declaratory judgment actions, bad faith defense and suspected insurance fraud claims. 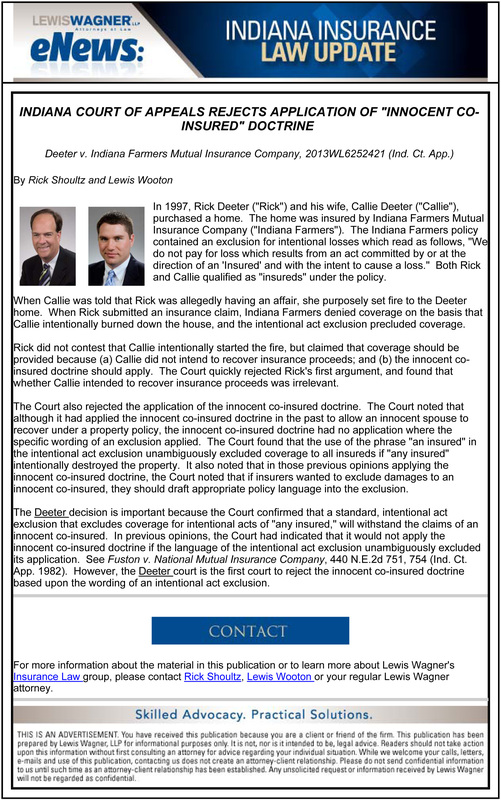 Rick is a frequent author and lecturer on insurance law and trial tactics and co-authors an electronic newsletter highlighting significant Indiana court decisions in the field of insurance law. After representing clients in attending hundreds of mediations, Rick now provides services as a mediator. Rick is a registered mediator who provides quality mediator services in all areas of his practice. Based upon his experience in insurance coverage matters, he feels his services in that area addresses a need for experienced mediators. Rick is a former collegiate baseball player, and enjoys following his favorite sports teams, studying the Civil War, and traveling. Court of Appeals affirms grant of summary judgment to employer who paid for drinks where employee was involved in an automobile accident. 07C01-1311-CT-000470Ms. Koller allegedly slipped and fell upon ice at the Hotel Nashville in Nashville, Indiana. There were significant questions associated with Ms. Koller’s contention that ice was present at the time of her fall. We were able to cast doubt upon Mr. Koller’s description of the conditions. Lewis Wagner, LLP’s client is an employer who had a holiday luncheon for its employees at a restaurant which began at 1:00 p.m. One of the client’s employees had prior instances of incidents after the consumption of alcohol. At the holiday party, the restaurant served two drinks to the employee which were paid for by the employer. The party ended at around 3:00 p.m. The employee left the restaurant and went to his home. Later, the employee drove to a nearby liquor store and purchased beer and tequila. He spent two hours consuming the alcohol that he had recently purchased. At around 8:30 p.m., almost five and a half hours after he left the holiday party, he was involved in an automobile accident with the plaintiffs while driving his own vehicle on personal activities. The plaintiffs filed a lawsuit against the employer and others alleging negligence. The plaintiffs argued that the employer was responsible for the employee’s intoxication and actions by organizing and supervising the Christmas party. Furthermore, the Plaintiffs contended the employer was responsible to exercise reasonable care with respect to the employee’s consumption of alcohol such that he would not sustain a “relapse” that lead to the chain of events because of his alcohol consumption. However, the Court of Appeals found that the employer actually exercised ordinary reasonable care in the organization of the holiday party, by refusing to allow the employees to go into the bar at the restaurant, and allowing only two drinks to be purchased by the employees. Furthermore, the Court found that the employee’s voluntary consumption almost six hours after the party ended represented an intervening cause of which the employer was not responsible. In this case, the employer was represented by Richard K. Shoultz and Edward Thomas. The Appellate decision can be found at Thompson v. Fields Gutter & Siding, Inc., 2014 Ind. App. Unpub. LEXIS 1006 (Ind. Ct. App. 2014). When insureds are involved in automobile accidents, volunteer fire departments typically respond and render environmental cleanup services. A collection agent for the volunteer fire departments often attempts to recover the expenses for the clean-up costs from accident victims and their insurance companies by contending that a right to collect such charges existed under the Comprehensive Environmental Response, Compensation, and Liability Act (“CERCLA”). 42 USC § 9601 et. seq. 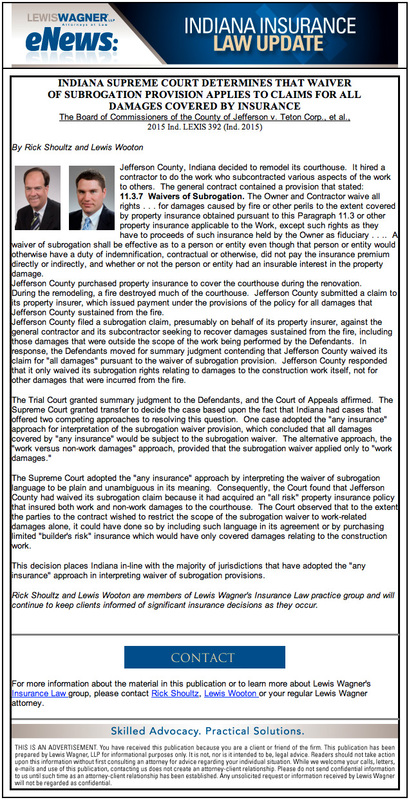 John Trimble and Richard K. Shoultz represented The Insurance Institute of Indiana, Inc., Property Casualty Insurers Association of America, and Wisconsin Insurance Alliance in asking the Seventh Circuit to affirm the Northern District of Indiana’s dismissal of the collection agent’s lawsuit against the insureds and insurance companies. The Seventh Circuit affirmed the dismissal, concluding that an insured’s use of an automobile that may have been involved in an accident qualified as part of a “consumer product” exception under CERCLA, which prohibited the use of the act to recover for environmental cleanup costs. It is anticipated that this decision will be a significant one in curtailing volunteer fire department’s efforts to overcome budget shortcomings by imposing environmental cleanup costs upon insureds and their insurance companies. The Indiana Supreme Court ruled in favor of an insurance company on the issue of the insured's obligation to give timely notice of a loss and timely notice of a lawsuit. 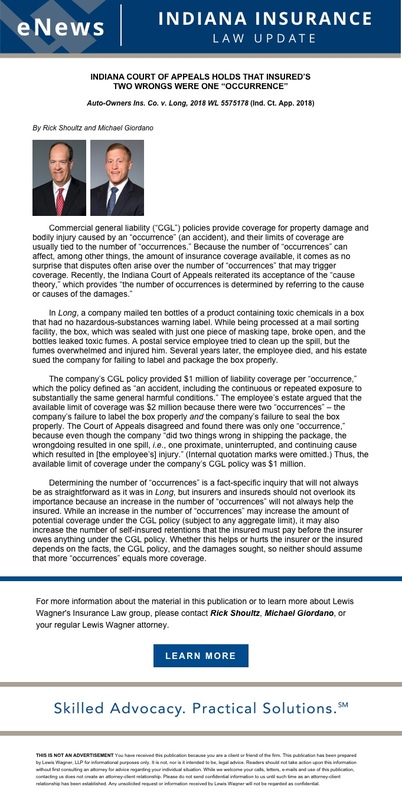 The Court also addressed the significant issue of what is an "occurrence" under a CGL policy. 2016 WL 276482Lewis Wagner team members, John Trimble, Richard Shoultz and Chuck Whybrew, were hired by the client to pursue post-judgment and appellate relief of an adverse verdict entered against the client. Specifically, the plaintiff, a renter of an automobile from a rental car company, was involved in an automobile accident with an underinsured motorist (“UIM”). The renter sought UIM coverage from the rental car company and its insurer, Empire Fire and Marine Insurance Company (“Empire”). Empire denied that any UIM coverage was available based upon language contained in the rental agreement and the insurance policy with the rental car company, whose terms were incorporated into the rental agreement. The Trial Court denied Empire’s Motion for Summary Judgment. Although the renter did not seek nor did the Court specifically grant summary judgment on the coverage issues to the renter, the trial court refused to allow Empire to argue its coverage defenses at trial. As a result, a significant verdict was entered against the insurance company. The Lewis Wagner attorneys first sought post-judgment relief at the trial court level by filing a Motion to Correct Error and for Additional Setoff. The Trial Court denied the Motion to Correct Error, but granted, in part, the request for setoff by reducing the judgment against Empire after deducting amounts received by the renter from the UIM. On appeal, the Court reversed the Trial Court’s denial of Empire’s Motion for Summary Judgment. Specifically, the Court found that any coverage provided by Empire was under a “commercial excess liability” policy, and pursuant to Indiana Code 27-7-5-2(d), such coverage was not required to be made available to insureds or rejected by them. Consequently, the Court instructed that summary judgment be entered in favor of Empire. School City of Hammond Dist. v. Rueth, 71 N.E. 3d 33 (Ind. Ct. App. 2017), trans. den. Counsel for school and hired to pursue appeal after $500,000 verdict entered against school (represented by a different law firm) on defamation and blacklisting claims. Court of Appeals reversed and entered judgment for school. Empire Fire and Marine Ins. Co. v. Frierson, 2016 WL 276482 (Ind. Ct. App. 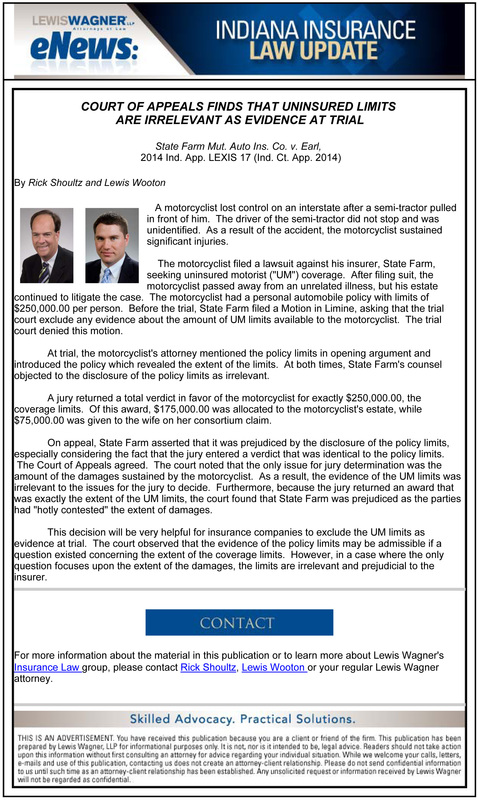 2016), Counsel for Defendant, arguing for reversal of jury verdict against insurer (represented by a different law firm) for trial court's errors in failure to grant summary judgment in underinsured motorist claim. Wellpoint, Inc. (f/k/a Anthem, Inc.) and Anthem Insurance Companies, Inc. v. National Union Fire Insurance Company of Pittsburgh, et al, Amicus counsel for The American Casualty Insurers Insurance Association, The National Association of Mutual Insurance Company, and The Property Association of America, addressing availability of liability coverage for allegations of bad faith by a medical insurance company (2015). Thompson v. Fields Gutter & Siding, Inc., 18 N.E.2d3d 319 (Ind. Ct. App. 2014) trans den. Counsel for Defendant, arguing that client lacked legal duty to be responsible for an employee's actions in becoming intoxicated outside scope of employment. Robinson v. Erie Ins. Exch., 9 N.E.3d 673 (Ind. 2014). 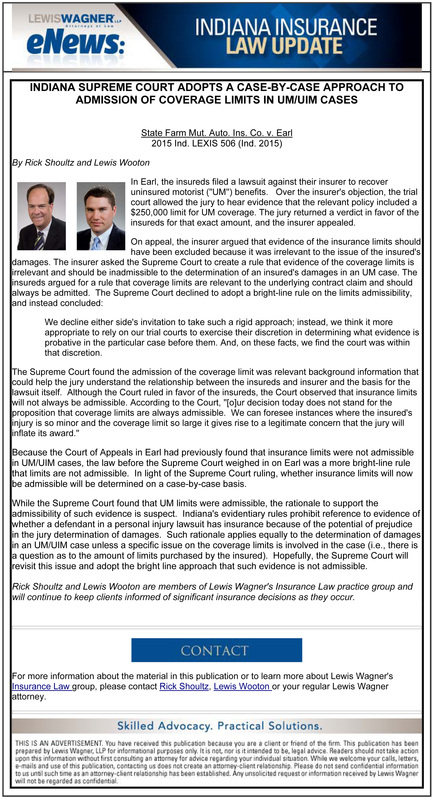 Counsel for Amicus Curiae, Insurance Institute of Indiana, Inc., arguing interpretation of limitation on uninsured motorist coverage for property damage claim. State of Indiana v. Doe, 987 N.E.2d 1066 (Ind. 2012). Counsel for Amici Curiae, Insurance Institute of Indiana, Inc., Manufacturers Association, and Indiana Chamber of Commerce, Inc., arguing that Indiana's statutory cap on punitive damages should be upheld. Emergency Services Billing Corp. v. Allstate Ins. Co., 668 F.3d 459 (7th Cir. 2011). 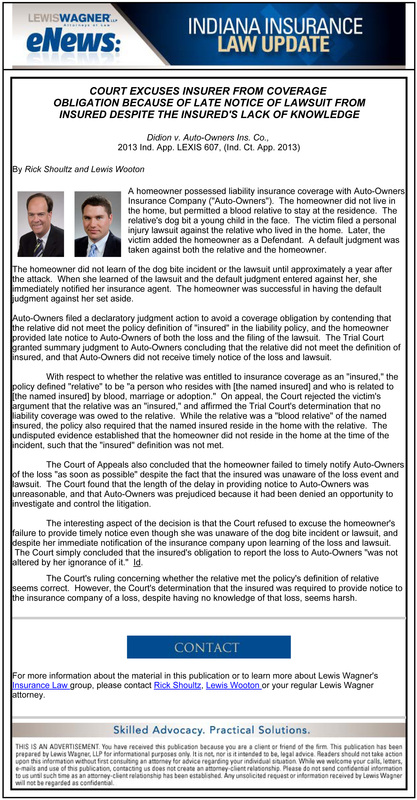 Counsel for Amici Curiae, Insurance Institute of Indiana, Inc., Property Casualty Insurers Assoc. of America, and Wisconsin Insurance Alliance, arguing issue of CERCLA application to volunteer fire department's request to cover cleanup costs after motor vehicle accident. Balagtas v. Bishop, 910 N.E.2d 789 (Ind. Ct. App., 2009). Counsel for Amicus Curiae, Insurance Institute of Indiana, Inc., arguing whether insurance company can offer partial uninsured motorists coverage to commercial insured. Tri-Etch, Inc. v. Cincinnati Ins. Co., 909 N.E.2d 997 (Ind. 2009). Counsel for Amicus Curiae, Insurance Institute of Indiana, Inc., arguing whether insurance company waives other coverage defenses if it also asserts defense that insured supplied late notice of claim. Bush v. State Farm Mut. Auto Ins. Co., 905 N.E.2d 1003 (Ind. 2009). 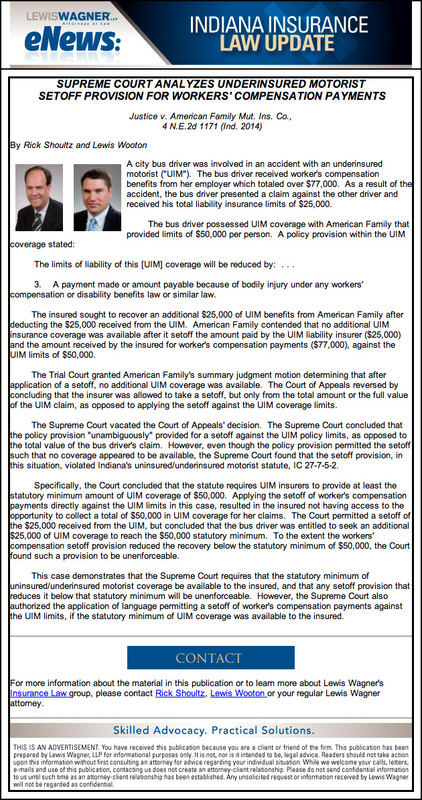 Counsel for Amici Curiae, Insurance Institute of America, Inc. and National Association for Mutual Insurance Companies, arguing whether "bodily injury" requirement in policy for uninsured motorist coverage violated Indiana public policy. Pflanz v. Foster, 888 N.E.2d 756 (Ind. 2008). Counsel for Amici Curiae, Insurance Institute of America, Inc. and National Association for Mutual Insurance Companies, arguing statute of limitations for remediation on environmental claim. Midtown Chiropractic v. Illinois Farmers Ins. Co., 847 N.E.2d 942 (Ind. 2006). Counsel for Amici Curiae, Insurance Institute of Indiana, Inc. and Property Casualty Insurers Association of America, on the issue of whether creditors of plaintiffs can bring direct actions against defendant insurance carriers. Barclay v. State Auto Insurance Companies, 831 N.E.2d 745 (Ind. 2005) trans. 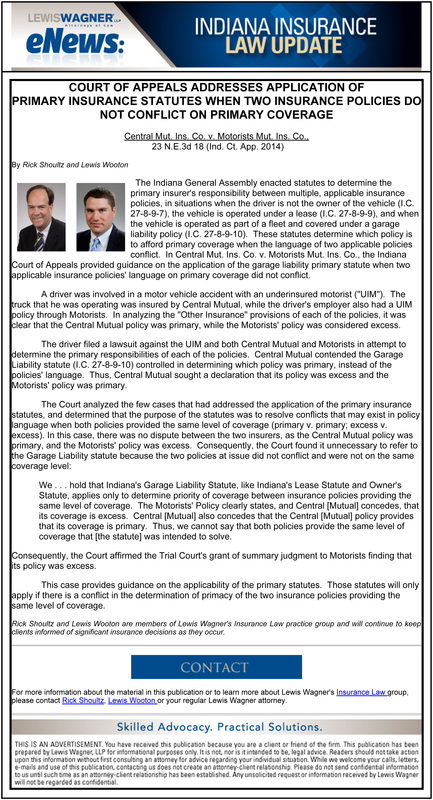 den., Counsel for Amici Curiae, Insurance Institute of Indiana, Inc. and Property Casualty Insurers Association of America, arguing policy interpretation by Court of Appeals and impact on insurance industry. Menefee v. Schurr, et. al., 751 N.E.2d 757 (Ind. Ct. App. 2001) trans. den., 774 N.E.2d 511 (Ind. 2002). Counsel for Amicus Curiae, Insurance Institute of Indiana, Inc., arguing issue of cause of action for third party bad faith by insurance company. Jesse v. American Comm. Mut. Ins. Co., 735 N.E.2d 238 (Ind. 2000). Counsel for Amicus Curiae, Insurance Institute of Indiana, Inc., arguing issue of rescission of insurance policy for material misrepresentation. Economy Fire & Cas. Co. v. Collins, 643 N.E.2d 382 (Ind. Ct. App. 1994) trans. den. Counsel for Amicus Curiae, Indiana Insurance Institute, arguing issue of insurance company liability for excess verdicts. Richey v. Chappell, 594 N.E.2d 443 (Ind. 1992). Counsel for Amicus Curiae, Indiana Defense Lawyers Association, arguing issue of discoverability of insureds statement to insurer. 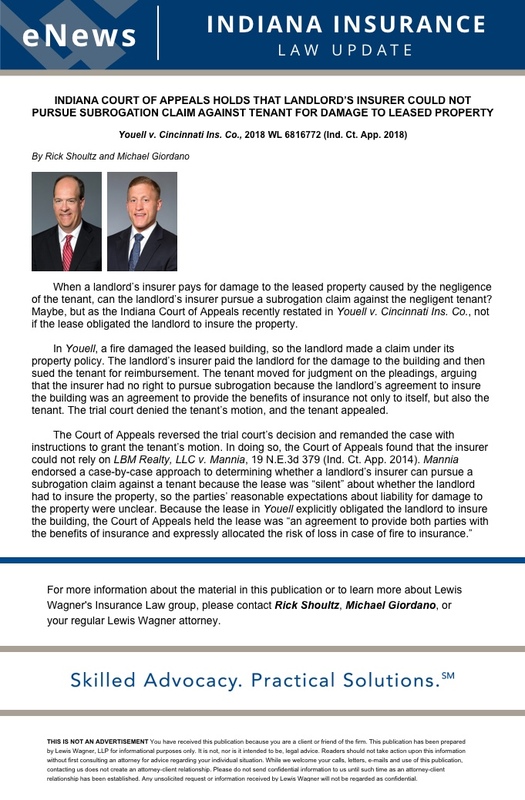 "Indiana Court of Appeals Holds That Landord's Insurer Could Not Pursue Subrogation Claim Against Tenant For Damage To Leased Property," Lewis Wagner Insurance Law Alert, January 25, 2019. "A Federal Court In California Addresses Whether Coverage Is Available To Drone Operator After It Strikes Wedding Attendee," Lewis Wagner Insurance Law Alert, January 9, 2019. 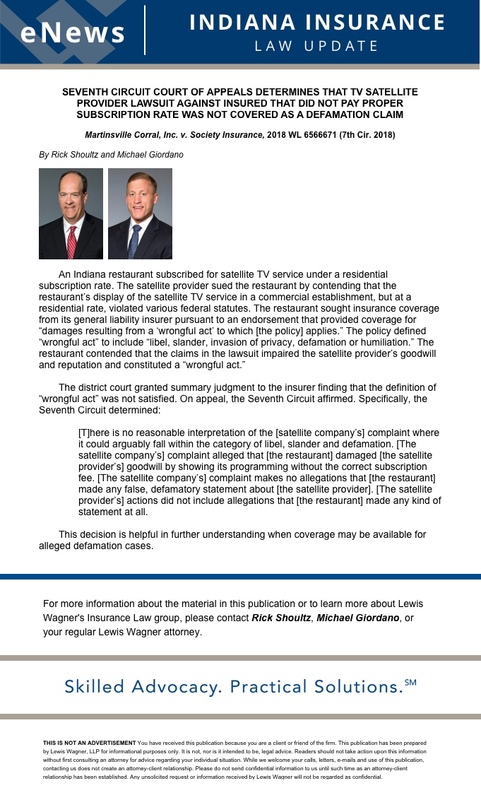 "Seventh Circuit Court of Appeals Determines That TV Satellite Provider Lawsuit Against Insured That Did Not Pay Proper Subscription Rate Was Not Covered As a Defamation Claim," Lewis Wagner Insurance Law Alert, December 19, 2018. "Court of Appeals Affirms Evidentiary Privilege Protection of Insured-Insurer In Bad Faith Litigation," Lewis Wagner Insurance Law Alert, November 27, 2018. "Florida Supreme Court Reinstates Bad Faith Verdict Against Insurer Despite Its Offer of Insured Policy Limits within Nine (9) Days of Accident," Lewis Wagner Insurance Law Alert, November 20, 2018. 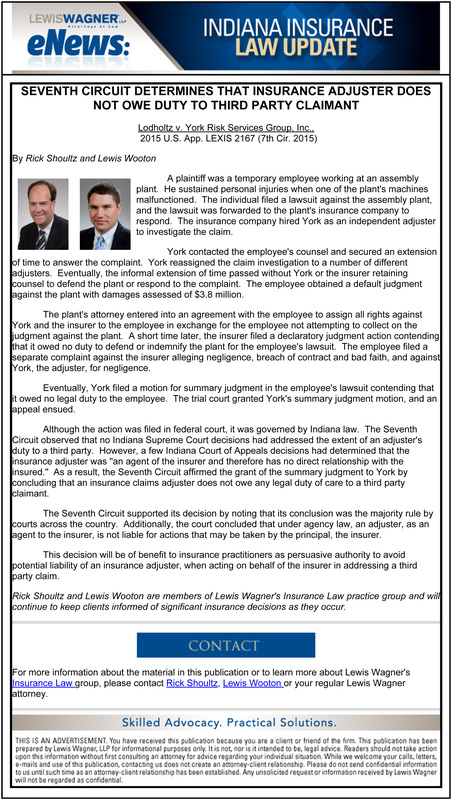 "Indiana Court of Appeals Holds That Insured's Two Wrongs Were One Occurence," Lewis Wagner Insurance Law Alert, November 14, 2018. "Federal District Court Addresses Whether Liability Insurance Coverage Existed For College Student's Sexual Assault Claims Against Fellow Student," Lewis Wagner Insurance Law Alert, November 9, 2018. "Indiana Court of Appeals Determines That Insured's Delay of At Least Nine Years In Giving Notice To Insurer of Environmental Liability Claim Resulted In Prejudice To The Insurance Company," Lewis Wagner Insurance Law Alert, November 2, 2018. "Indiana Court of Appeals Determines That Named Insured Cannot Recover Uninsured Motorist Coverage While Riding As A Passenger In His Own Vehicle," Lewis Wagner Insurance Law Alert, October 19, 2018. "Indiana Court of Appeals Holds Insurer's Effort To Collect Subrogation Lien From Insured's Attorney Subject to Two-Year Statute of Limitations," Lewis Wagner Insurance Law Alert, September 20, 2018. "Court Of Appeals Determines That Insurance Agent Lacked Legal Duty To Motorist Injured In Automobile Accident With Customer Who Sought Insurance Coverage From The Agent," Lewis Wagner Insurance Law Alert, August 10, 2018. "Indiana Court of Appeals Refuses To Apply Business Use Exclusion To Auto Policy For Home Healthcare Worker Traveling Between Jobs," Lewis Wagner Insurance Law Alert, June 1, 2018. "Indiana Court of Appeals' Decision Holds That Injured Motorist's Release With One Alleged Tortfeasor Barred Claims Against All Alleged Tortfeasors," Lewis Wagner Insurance Law Alert, June 1, 2018. "Indiana Court of Appeals Remands Case For Trial Court To Determine If Landlord's Insurer Has Viable Subrogation Claim Against Tenant," Lewis Wagner Insurance Law Alert, March 23, 2018. "Federal Court Outlines Characteristics of Proper Insurance Company Reservation of Rights Letter," Lewis Wagner Insurance Law Alert, March 2, 2018. "Seventh Circuit Affirms Jury Determination That Insured Resided In Home Destroyed By Fire And Was Properly Awarded Home's Actual Cash Value Damages," Lewis Wagner Insurance Law Alert, February 27, 2018. “Indiana Court Of Appeals Requires Health Insurer To Pay Medical Expenses Incurred During Grace Period For Late Premiums,” Lewis Wagner Insurance Law Alert, January 25, 2018. “Indiana Supreme Court Denies Transfer of Case Holding That Insurer Has No Duty to Defend Additional Insured Until Named Insured Satisfies Self-Insured Retention,” Lewis Wagner Insurance Law Alert, November 13, 2017. “Where tortfeasor's insurer denied coverage because of his breach of cooperation clause, the tortfeasor was considered "uninsured motorist" to allow plaintiff to recover uninsured motorist benefits,” Lewis Wagner Insurance Law Alert, October 9, 2017. 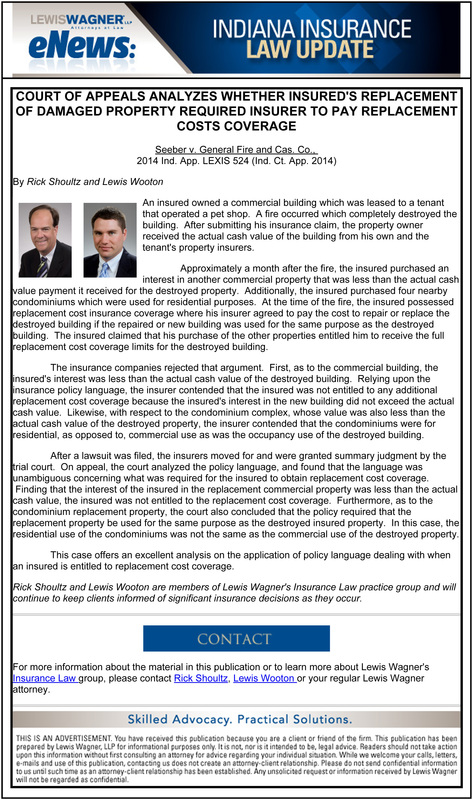 "In an unpublished decision, Court of Appeals enforces property policy language limiting insurer coverage obligation to actual cash value of destroyed home," Lewis Wagner Insurance Law Alert, June 13, 2017. "Court holds that death resulting from road-rage incident did not arise out of the use of the insured's auto," Lewis Wagner Insurance Law Alert, April 27, 2017. "Seventh Circuit concludes that exclusion did not apply to named insured friend's lawsuit for injuries sustained while walking dog," Lewis Wagner Insurance Law Alert, August 29, 2016. "Supreme Court finds insurance policy ambiguous in comparing policy limitation of action clause to policy's requirement for exhaustion of tortfeasor's policy limits in UIM case," Lewis Wagner Insurance Law Alert, August 24, 2016. "Court of Appeals interprets whether student's operation of car during a school class qualified for insurance coverage under school's policy," Lewis Wagner Insurance Law Alert, August 4, 2016. “Indiana Appellate Court refuses to determine, as a matter of law, that proposed insured was "resident" of another's "household" in order to be entitled to insurance coverage,” Lewis Wagner Insurance Law Alert, March 7, 2016. "Seventh Circuit affirms motion to dismiss insured claim for personal injury insurance claim for personal injury insurance coverage based upon lack of publication in defamation claim," Lewis Wagner Insurance Law Alert, December 15, 2015. "The Court of Appeals enforces contractual limitation of action provision on UIM claim," Lewis Wagner Insurance Law Alert, November 19, 2015. "The Court of Appeals concludes that insurer did not breach duty of good faith by recommending cleaning contractor to insured after fire," Lewis Wagner Insurance Law Alert, September 9, 2015. "The District Court concluded that general liability insurance policy did not cover shooting event outside adult cabaret," Lewis Wagner Insurance Law Alert, August 19, 2015. 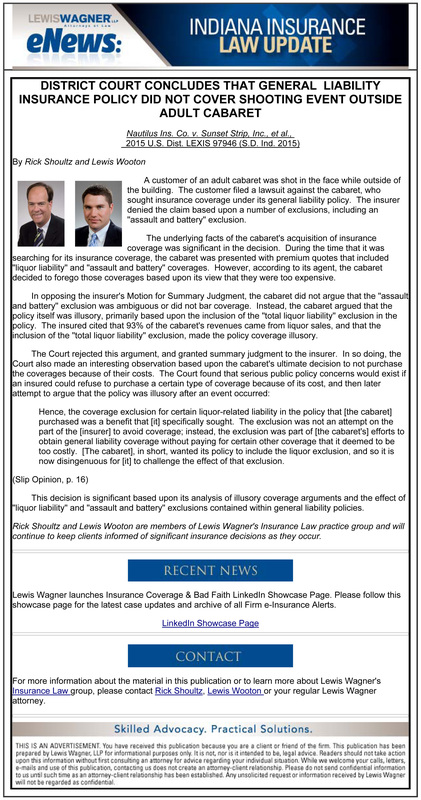 "Indiana Supreme Court adopts case-by-case approach to admission of coverage limits in UM/UIM cases," Lewis Wagner Insurance Law Alert, July 9, 2015. "Indiana Supreme Court determines that waiver of subrogation provision applies to claims for all damages covered by insurance," Lewis Wagner Insurance Law Alert, June 4, 2015. 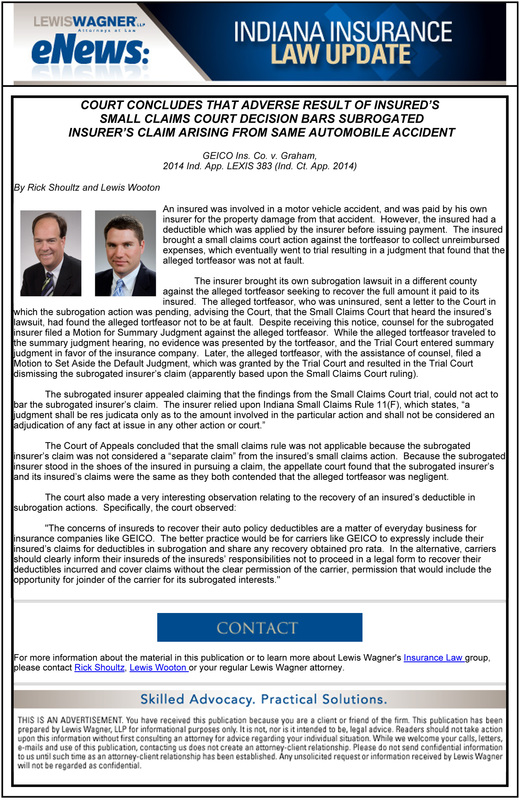 "Seventh Circuit Determines that Insurance Adjuster Does Not Owe Duty to Third Party Claimant," Lewis Wagner Insurance Law Alert, March 23, 2015. "Court of Appeals Addresses Application of Primary Insurance Statutes When Two Insurance Policies Do Not Conflict On Primary Coverage," Lewis Wagner Insurance Law Alert, March 16, 2015. "Court of Appeals Analyzes Whether Insured's Replacement of Damaged Property Required Insurer to Pay Replacement Costs Coverage," Lewis Wagner Insurance Law Alert, December 8, 2014. 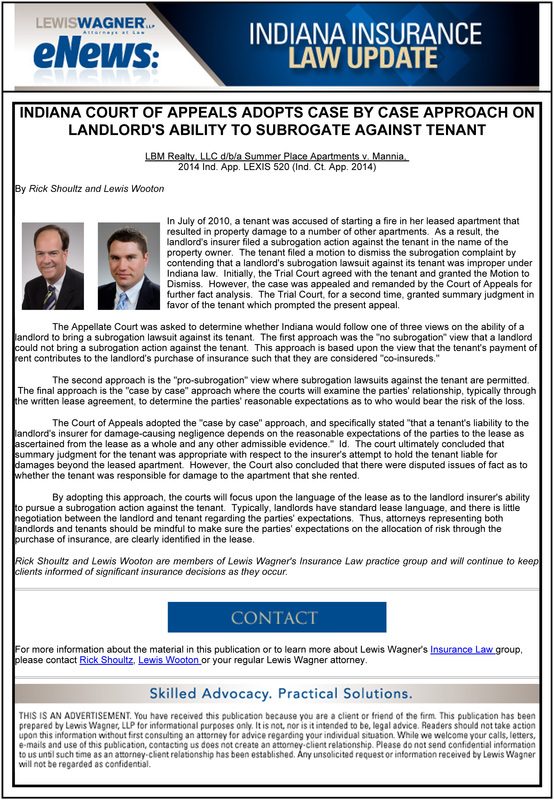 "Indiana Court of Appeals Adopts Case by Case Approach on Landlord's Ability to Subrogate Against Tenant," Lewis Wagner Insurance Law Alert, December 2, 2014. "Court Concludes that Adverse Result of Insured’s Small Claims Court Decision Bars Subrogated Insurer’s Claim Arising from Same Automobile Accident," Lewis Wagner Insurance Law Alert, August 26, 2014. Indiana Law Review, "Survey of Recent Developments in Insurance Law," 47 Ind. L. Rev. 1111, 2014. “Supreme Court Analyzes Underinsured Motorist Setoff Provision For Workers’ Compensation Payments," Lewis Wagner Insurance Law Alert, August 12, 2014. “Court Excuses Insurer from Coverage Obligation Because of Late Notice of Lawsuit from Insured Despite the Insured’s Lack of Knowledge,” Lewis Wagner Insurance Law Alert, March5, 2014. “Indiana Court of Appeals Determines that an Insurance Agency Owed a Special Duty to Advise Its Insured About Insurance Coverages and that Insurance Company Could Be Vicariously Liable for Agent's Actions,” Lewis Wagner Insurance Law Alert, February 26, 2014. “Indiana Court of Appeals Finds that Uninsured Limits are Irrelevant as Evidence at Trial,” Lewis Wagner Insurance Law Alert, February 19, 2014. “Indiana Court of Appeals Rejects Application of “Innocent Co-Insured” Doctrine,” Lewis Wagner Insurance Law Alert, January 21, 2014. 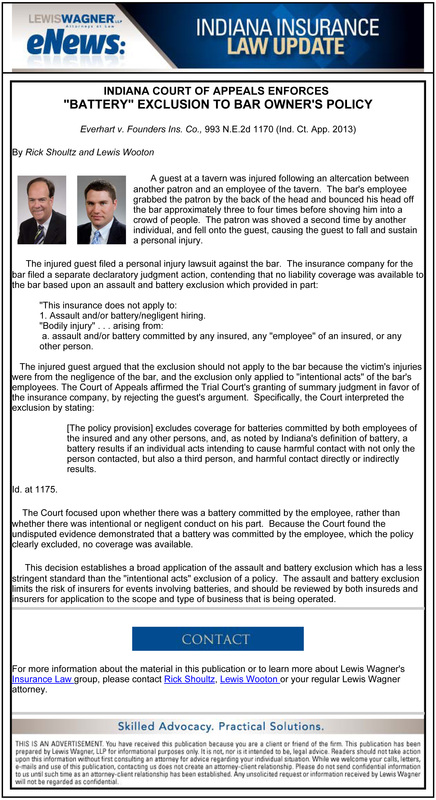 “Indiana Court of Appeals Enforces “Battery” Exclusion to Bar Owner’s Policy,” Lewis Wagner Insurance Law Alert, December 11, 2013. “Indiana Court of Appeals Determines that Insured is Entitled to Uninsured Motorist Coverage for Property Damage Claim,” Lewis Wagner Insurance Law Alert, August 29, 2013. 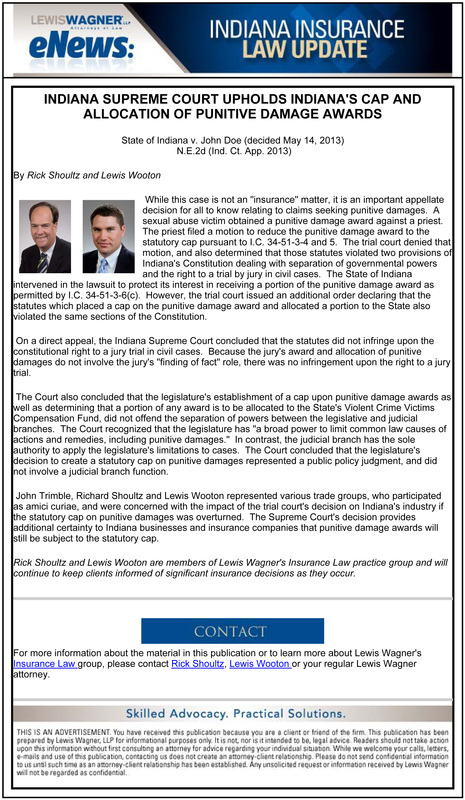 “Indiana Supreme Court Upholds Indiana's Cap and Allocation of Punitive Damage Awards,” Lewis Wagner Insurance Law Alert, May 31, 2013. 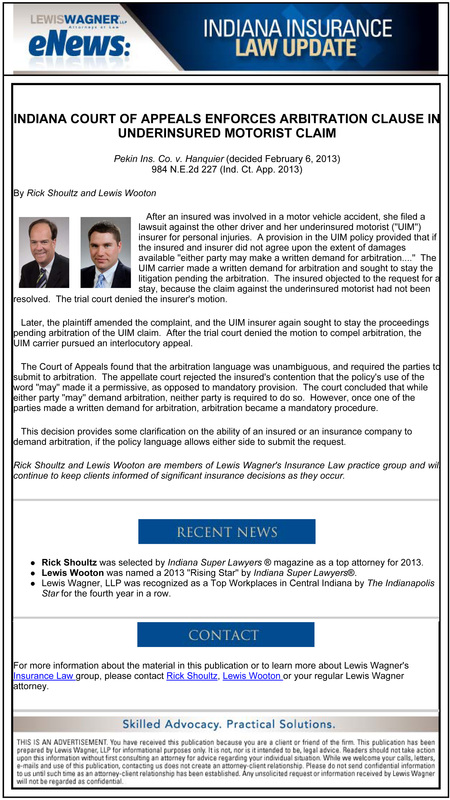 “Indiana Court of Appeals Enforces Arbitration Clause in Underinsured Motorist Claim,” Lewis Wagner Insurance Law Alert, May 1, 2013. 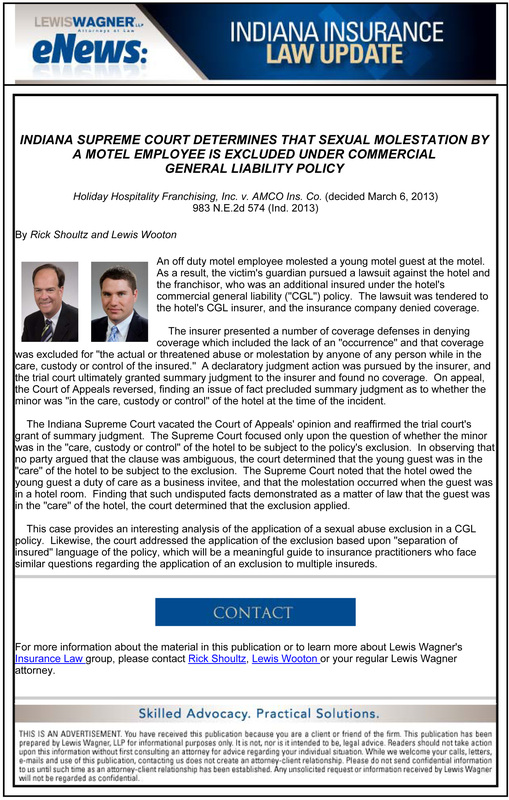 “Indiana Supreme Court Determines that Sexual Molestation by a Motel Employee is Excluded Under Commercial General Liability Policy,” Lewis Wagner Insurance Law Alert, April 11, 2013. 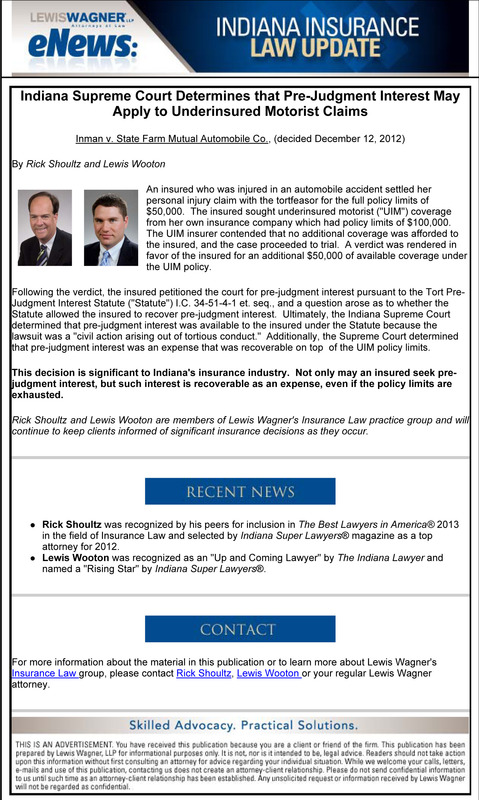 “Indiana Supreme Court Determines that Pre-Judgment Interest May Apply to Underinsured Motorist Claims,” Lewis Wagner Insurance Law Alert, January 16, 2013. Indiana Law Review, "Survey of Recent Developments in Insurance Law," 46 Ind. L. Rev. 1141, 2013. Indiana Law Review, “Survey of Recent Developments in Insurance Law,” 45 Ind. L. Rev. 1227, 2012. Indiana Law Review, “Survey of Recent Developments in Insurance Law,” 44 Ind. L. Rev. 1337, 2011. Indiana Law Review, “Survey of Recent Developments in Insurance Law,” 43 Ind. L. Rev. 815, 2010. Indiana Law Review, “Survey of Recent Developments in Insurance Law,” 42 Ind. L. Rev. 1055, 2009. Indiana Law Review, “Survey of Recent Developments in Insurance Law,” 41 Ind. L. Rev. 1115, 2008. 20th Annual Trial Advocacy Skills College, Indiana Continuing Legal Education Forum, March 18-19, 2017, Faculty Member. 19th Annual Trial Advocacy Skills College, Indiana Continuing Legal Education Forum, March 17-18, 2016, Faculty Member. Recent Insurance Law Decisions, Indiana Department of Insurance, September 18, 2015. Qualified Settlement Offers / Pre-Judgment Interest Demands / Proposals for Settlement, Personal Injury Claims: The Insurance Defense Perspective, National Business Institute, August 21, 2015. Real World Mediation and Trial Tactics, Personal Injury Claims: The Insurance Defense Perspective, National Business Institute, August 21, 2015. 18th Annual Trial Advocacy Skills College, Indiana Continuing Legal Education Forum, March 18-22, 2015, Faculty Member. As Judges See It: Best (and Worst) Practices in Civil Litigation, National Business Institute, November 7, 2014, Moderator. Insurance Coverage Litigation 2013, Causes of Action/Pleadings: Current Issues and Emerging Trends, Discovery Tactics and Disputes, National Business Institute, November 14, 2013. Insurance Coverage Issues Inside and Out, Indiana Continuing Legal Education Forum, October 2, 2013. The Art of the Settlement, National Business Institute, November 16, 2012. Arson for Profit, Indiana Chapter of Indiana Association of Special Investigator Units, October 4, 2012. Construction Accident Litigation, Indiana Continuing Legal Education Forum, December 6, 2012. Arson for Profit, International Association of Special Investigation Units, Indiana Chapter, October 4, 2012. Uninsured/Underinsured Motorist Law 101, National Business Institute, September 4, 2011. Handling the Auto Injury Claim, National Business Institute, April 15, 2011. Insurance Law Alert: INDIANA COURT OF APPEALS HOLDS THAT INSURED'S TWO WRONGS WERE ONE "OCCURENCE"